Carolina Mantis gravid (pregnant) with eggs. Chinese Mantis gravid with eggs. "Praying" mantis have long fascinated people. The very term "mantis" comes from ancient Greek meaning "prophet" or "seer" due to the way they hold their legs in prayer-like fashion. Most folks know that a more appropriate name would be "preying" mantis because of their predatory nature. All mantis have a unique ability to turn their heads around much more than other insects. They are said to be the only insects that can look over their shoulders. Perhaps this along with their religious pose, triangular heads, and large eyes endear them to people as well. There are 20 species of mantis in North America. Unfortunately, of the two we commonly see around here, the most likely one we encounter is the non-native Chinese Mantis (Tenodera aridifolia). Our native Carolina Mantis (Stagmomantis carolina) is no longer seen as often any more, especially near cities. There are some distinct differences between the two, at least once they are full grown. Carolina Mantis are smaller, the flightless females (which are always bigger than males in mantis) being under 3" long. Chinese Mantis are larger, the females getting to about 4". Chinese Mantis also have wings that extend beyond their abdomen, while the female Carolina Mantis have wings that only extend part way along the back (see photos, though doesn't hold as true for males). The Chinese Mantis also usually has a light colored line along the bottom edge of its wings that the other often lacks (especially if they are green or brown in color). The egg cases (called "ootheca") also differ, with the Carolina having a long egg case while the Chinese has an oblong one (see photos below) looking as though the bottom was sliced off. Both species can vary widely in color, though the Chinese Mantis tend to be green rather than the other colors of grey or brown. Various mantis were introduced into North America because of their purported value as beneficial insects that feed on pest species. The Chinese Mantis for example was first released in 1896 and are now by far our most common species. Mantis unfortunately are not very good as biological control agents. First of all, you can not make them eat what you target them to prey on. They will go for the easiest food item they can skewer with their raptorial spiny legs. They are just as likely to eat pollinators or other beneficial insects as pest species. Some studies even point out that Chinese Mantis grow larger and produce more eggs if they consume pollen as part of their diet, especially for females that are gravid full of eggs. It is no coincidence then that we often find large Chinese Mantis perched on flowering plants and eating the pollen covered pollinators that visit the flowers. A Chinese Mantis feeds on a pollinator off a goldenrod bloom. Mantis are also cannibalistic, so you never have enough of them around to make much of an impact on pest species. Since big mantis eat little mantis, our smaller native Carolina Mantis are becoming more and more scarce as more gardeners introduce Chinese Mantis into their gardens in the mistaken intention of using them as biological controls. It doesn't help that a typical Carolina ootheca produces about 50 eggs, while the Chinese might produce 350 eggs. Carolina Mantis, gravid and showing a color variation. Note the smaller size as compared to the Chinese Mantis also pictured on my hand in the photo above. As already mentioned, mantis are cannibalistic and will eat anything smaller than themselves (and sometimes they go after larger prey which account for stories of Chinese Mantis catching small hummingbirds, lizards, frogs, and even mice). This makes mating a dangerous prospect for the smaller males. Often times they are eaten in the process, losing their heads first. They have evolved however to be able to continue to mate even if headless. Some theorize that the extra large meal helps the female to produce even more eggs, perhaps a last sacrifice by the father. Finding a headless mantis this time of year is usually a sign of these reproductive activities. Even if mantis survive mating, find plenty of food, and/or are taken indoors, their days are numbered. Regardless of circumstances, they do not survive much longer than late November. They last a single season, eating and being eaten. There is so much that fascinates about these creatures (I didn't go into how they develop a single ear between their legs, the only creatures in the world with a solitary ear). I have fond memories of the many I raised as a kid and others I watched hunting in meadows, or them watching me over their shoulders like only mantis can do. This Saddleback caterpillar (Acharia stimulea) showed up at a master naturalist field trip I was co-leading last year. This is one of our largest slug caterpillars (they're called this because of the way they move in a gliding fashion, with no legs showing), but you can see how small it really is. The sting hurts to be sure, but is not that big a deal for most folks and I was not afraid of getting stung. They're neither aggressive nor quick. There's been a lot of sensational info on stinging caterpillars, but they're mostly not a problem around here unless you happen to be allergic (which can happen if you're allergic to anything and is rare regardless, but it can happen, as my wife can attest to from an encounter with a stinging Barboso caterpillar in her home country of El Salvador that had her hospitalized a week). Most members of the slug caterpillars, family Limacodidae, are armed with stinging hairs. You can actually see the stinging spines on this one. This is considered the most powerful sting among our native slug caterpillars. Because they use their stinging spines in the construction of their protective cocoons, even these can sting. You can also see the warning colors and the saddle-marks that give them their name. Their stinging abilities do not protect them from all predators though, with wasps in particular preying on them. Braconid wasps insert their eggs into them and the wasp larvae feed on the inside, leaving the vital organs until the last. The walking caterpillar is a zombie. When the white little wasp cocoons show up on the outside of the caterpillar, it is basically dead but still moving. I've also seen paper wasps bite off the stinging spines so they can take them back to their nests to feed their young safely. Just today I found a Saddleback crossing the entry road to one of our nature centers. Having heard that they won't sting when gliding over you, I decided to test that theory. So I let it crawl onto my finger for about 20 minutes and can attest that this particular one at least did not sting me. Apparently Saddlebacks can crawl on you without stinging. The stinging hairs are pretty evident along its back however. These beautiful caterpillars are polyphagic, meaning they can eat a lot of different plants. I've found them on corn, maples, oaks, elms, apple trees, even English Ivy (which almost no other native creature eats). They've also been reported feeding on the leaves of blueberry, beans, buttonbush, cabbage, citrus, grasses, grapes, linden, ash, dogwoods, cherries, iris, viburnums, and asters. The worst experience I ever had with them was when I bumped into some stinging nettles and of course got stung. A second later I got tagged again by the Saddleback that I had accidentally picked up that was feeding on the stinging nettle. A double whammy. While most moths fly at night and are drab, a few don't follow that trend. 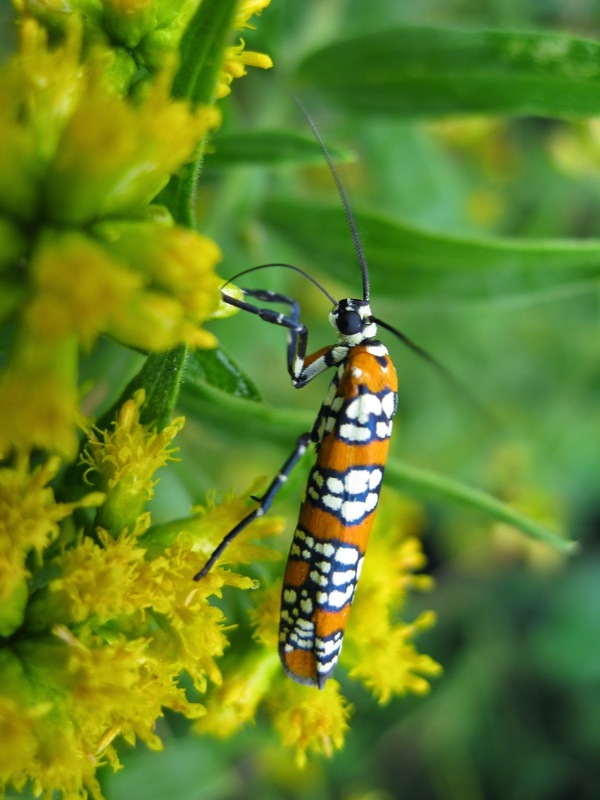 One of these is a colorful daytime flying moth called the Ailanthus Webworm Moth (Atteva aurea). These are very common and very visible from now through the Fall, especially favoring goldenrod to nectar at. They are one of the few native insects that has benefited from the introduction of an invasive alien exotics plant, the Ailanthus, or Tree-of-Heaven. Formerly, Ailanthus Webworm Moths were limited to areas where their original caterpillar food host plant, the Paradise Tree (Simarouba glauca and Simarouba amara), grew in the tropics to Southern Florida. When the Ailanthus Tree (Ailanthus altissima) was introduced from China, it was similar enough that the caterpillars were able to feed on it. In fact, now the caterpillars are so associated with the widely spreading invasive plant that even their common name reflects this. The caterpillar and moth are now found well outside their original range and are as common as their exotic pest host plants. The moth is quite colorful, likely as a warning that it is distasteful due to the chemicals it ingests from its food plants. People often confuse it for a butterfly because of its diurnal nature and colors. It loves to nectar at such plants as goldenrods, asters, ironweeds, and other blooms, performing some minor pollination services. The caterpillars fold together several leaves and wrap them in webs, feeding inside this protective shelter. Although this is the only plant they eat in our region, they rarely do much real damage to the tree itself and are not really a natural control for this invasive pest plant. I enjoy seeing these colorful moths now in our region and take some pleasure that their caterpillars feed on the invasive tree. Rare is the case where invasive species provide much benefit to native creatures, in fact the contrary is almost always the case. Helping this moth expand well outside its native range does not make up for the damages the invasive plants cause. Regardless, it is good to know that at least one creature has had this luck and adds its colors to those in our meadows, fields, and roadsides. Black Nightshade in fruit in my yard. The Nightshade family (Solanaceae) is surrounded by all sorts of legends and stories dealing with their toxicity, despite several edible members (such as tomatoes, potatoes, and hot peppers) being in the same family. Indeed, many members contain potent toxic alkaloids including such plants as Deadly Nightshade, Mandrake, Sacred Datura, and Jimsonweed (which was used locally for very important hallucinogenic rituals by the Native American Indians and which I should do a post about). Many of them can and have killed people. Atropa Belladonna was used for example by some prominent Romans to murder competitors. Black Nightshade with the distinctive flowers typical of the Nightshade family, much like tomatoes. You can imagine my reaction then when my wife several years ago found a nightshade growing in our yard and declared it to be just like the ones they used to eat back in her home country of El Salvador. One look at the flower and I knew it to be a nightshade of some sort. I also explained to her that many were indeed quite poisonous and that there were many plants that could look quite similar, but that could be quite different (even if within the same family) from one country to another. Despite how sure she was, I told her it would be a very bad idea to try and eat it. A week passed and one evening my wife served me a delicious soup. As I devoured it, she asked me what I thought of it. I liked it, I told her, and she explained to me that the main ingredient was "Mora." Now Mora in my ancestral home of Peru means "mulberry" (the scientific Genus for mulberry is Morus by the way). I told her that it didn't taste like mulberry fruit one bit and it was too late in the season to find any anyways. She revealed to me that it wasn't that plant actually, and that it didn't even contain any fruits or berries at all. It was made using the leaves of the plant she had pointed out to me earlier that also grew in her homeland and was called "Mora" by Salvadorans. I did a double take as I digested the new information, and stopped my digestion of the nightshade soup she had served me (and which I had nearly finished). Several things ran through my mind at that moment: that I shouldn't have taken out that life insurance policy, that I knew many potentially deadly members of this plant family, and that I really needed to positively identify that plant (as well as have the poison control center number ready). I luckily had a few good resources available, but could do no better than it was called Black Nightshade. This plant is sometimes simply classified as Solanum "nigrum" but many others now believe it to be a complex of various species and maybe subspecies. I couldn't get a perfect ID other than that. More worrisome was that the common name Black Nightshade had contradictory information, some saying it was edible while others saying it was poisonous. Thankfully, I had on hand my favorite foraging book, the one by Samuel Thayer called "Nature's Garden" and it had Black Nightshade listed. I consider Thayer's two books the absolute best on the topic of wild edibles and foraging and so trusted it as the best resource. According to his very detailed and illustrated book, Black Nightshade is indeed edible both as greens and ripe fruits, regardless of which species in the complex you eat. The confusion, he believes, is in the use of the common name and the poor reputation of the Nightshade family. 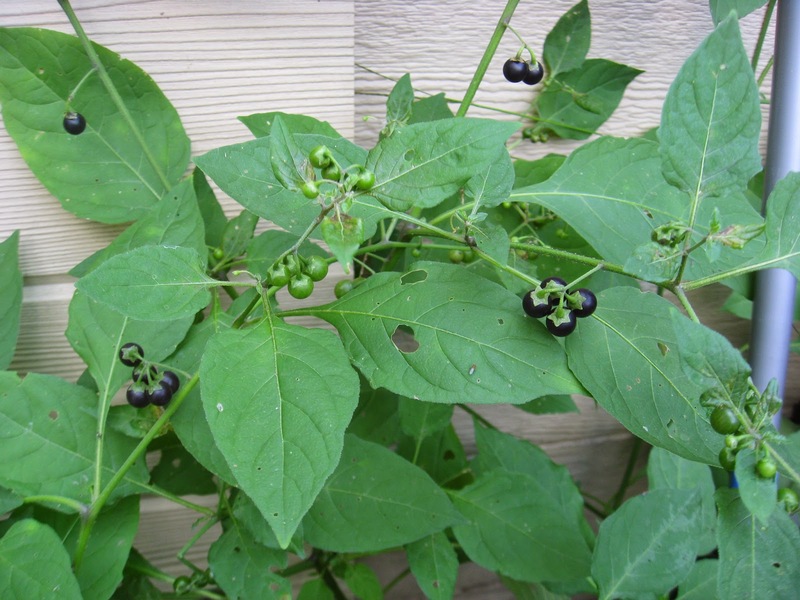 The aforementioned Atropa belladonna is also sometimes called Black Nightshade (as well as Deadly Nightshade and Belladonna) and is quite toxic. Thayer theorizes that poisonings from eating "Black Nightshade" are from eating this particular plant. I was positive that what I had consumed with such relish was luckily not that plant, as they are fairly different in appearance. That I'm still alive today, that I make sure to spread some Black Nightshade seeds every year to get more plants, and that my family continues to eat it, are all proof of the edibility of Black Nightshades in the Soluanum nigra complex. The variety found around here is usually classified as Solanum ptycanthum nowadays. It also helps show the importance of universally accepted scientific names rather than regional common names. 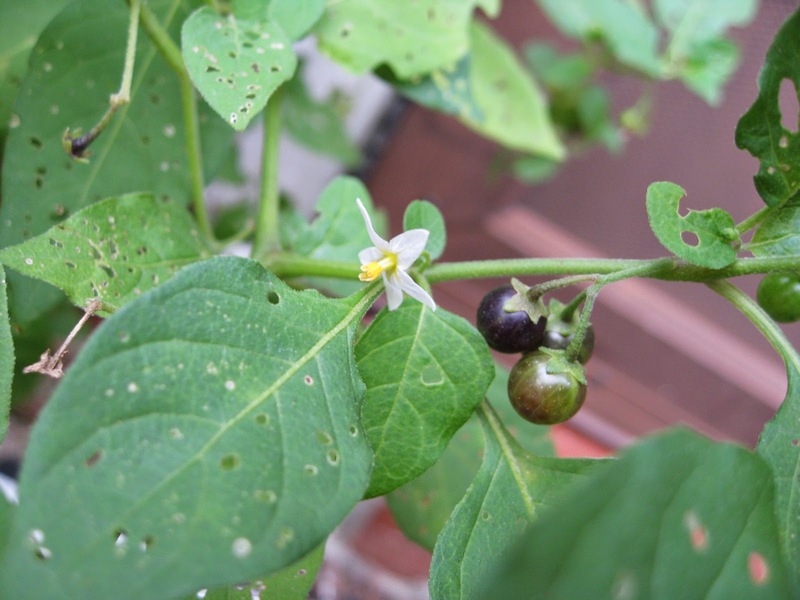 Black Nightshade, despite its dangerous reputation, has both edible leaves and ripe fruits. This native plant is an annual (thus why I keep making sure I spread some seed into strategic locations in my yard every year). A version of it has been consumed (or feared) across most of the world. Our own native peoples had some tribes who considered it edible, others medicinal, and yet others poisonous. Porcher's Confederate Ethnobotany considered it to have have medicinal properties but stressed its supposed dangerous effects as well. So my family continues to eat this plant, both as greens and when the fruit is ripe. My wife was right, which she likes to point out to me in many other things as well. Luckily most of the time my life isn't at stake when she tries to prove this to me. An Elephant Mosquito nectars on Boneset flowers. After yesterdays Facebook video on "wrigglers" as mosquito larvae are called, I thought I would follow up with this impressive mosquito species. Elephant Mosquitoes (Toxorhynchites rutilus) are labelled this way due to their large size for a mosquito. They are imposing looking creatures, big with a very prominent and fierce looking proboscis. One would not want to have one of these feed on you (though they are smaller than Crane Flies that are often confused for gigantic mosquitoes and do not harm us). Luckily, these big mosquitoes are not only harmless, but actually beneficial. Not only do they NOT feed on blood, the adults feed mostly on nectar, sap, and perhaps rotting fruits. The huge proboscis helps them access the deep flowers and they are thus minor pollinators (which male mosquitoes of most species are anyways). As if that wasn't enough, the young Toxo mosquitoes feed on small aquatic creatures, having a special taste for other mosquito larvae ("wrigglers"). While most female mosquitoes need a blood meal in order to produce their eggs, the Elephant Mosquitoes (or "Mosquito Hawks" as they are sometimes called) get their protein from the mosquito larvae they eat while young. An individual may cannibalize up to 400 other skeeters before reaching adulthood. This predatory trait and benefit as pollinators has made them the subject of testing as a biological control for mosquito pest species. Although there have been successes in these attempts (including introducing them into other countries and places such as Hawaii to control disease bearing mosquitoes), they are never as numerous as the smaller pests they eat. They also hatch very quickly and takes a lot of man power to get a population into production, all factors that make this yet an experimental biological control. Still, we have them occurring naturally around here, much to our benefit and to some plants. So the next time you see what appears to be an especially large and nasty looking skeeter, take a second look. It could well be a Mosquito Hawk helping to naturally keep the other mosquito numbers in check.